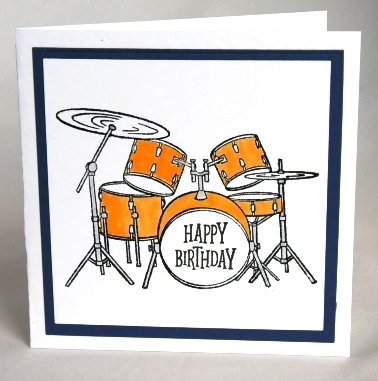 I have stamped the drum kit onto white card and then die cut the design into a square. The design is mounted onto dark blue card also die cut in a square. I then painted the drum set in a rich yellow colour and stamped Happy Birthday onto the drum. The card is blank inside for your own birthday greetings. If ordering by phone, please reference card #767.